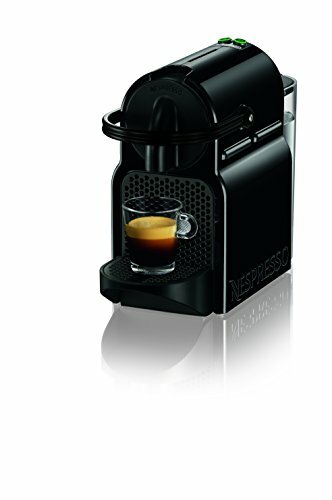 The Nespresso Inissia is the latest product in the popular Nespresso range. This range includes flagship models like the Pixie and the Maestria. On one level, Inissia is a continuation of the tradition which has made the Nespresso Machine brand beloved by its aficionados from all over the world. On another level, the Inissia sets its own standard. In fact, some users have termed it the best machine ever – not because it packs an assortment of advanced features. What makes the Inissia endearing is the fact that it packs features which should be beyond its price range. The biggest frustration users often have with espresso coffee makers is preheating. This is the period the coffee machines take to warm up before beginning to brew the beverage. Most machines take too long to preheat – something which is quite annoying. The Inissia doesn’t create such frustrations. At only 25 seconds, its preheating time is among the fastest on the market. This makes great for making a beverage on short notice. The preheating time is even faster than for it’s more costly cousins – the Pixie and Maestria. The Inissia is fitted with the maximum 19-bar high pump pressure. This is standard for most high-end machines. However, it is much higher than for other products within Nespresso Inissia’s price range. The presence of such a high pump pressure means that the quality of beverage that the Inissia brews are premium grade. The Nespresso lnissia has a 24 ounce (700 ml) water tank. Granted, this isn’t the largest water tank out there. However, given the Inissia’s compact size, the capacity is quite impressive. The water tank is fully detachable which makes it quite easy to use. It also has a lid – which prevents spillages between the tap and the machine. The Inissia has two programmable buttons – one for espresso and another for lungo preparation. The buttons can actually be used to turn the machine on and off. This basically simplifies using usage. As such, the Inissia doesn’t require a long learning curve in order to make delightful beverages. The Inissia has an inbuilt mechanism which simplifies inserting and ejecting capsules. There is a bar which when rotated towards the front opens a slot in which the capsules can be inserted. Once the machine has finished brewing, rotating the bar again ejects the capsule. The Inissia actually has a capsule container which collects the used capsules. The container can hold between 9 and 11 capsules. This means that the machine can be used several times before emptying the used capsules. Besides the ones listed above, the Inissia has other features. First of all, it has an automatic energy-saving feature which automatically turns off the machine after 9 minutes of inactivity. This makes the machine energy efficient. Secondly, it has a cup tray which can be used to hold cups while during serving. The cup tray has a fold-back capability. This comes in handy especially when a user desires to collect their drink in a larger cup. Finally, people shopping for Inissia have the choice of purchasing an upgraded option which includes a stand-alone Aeroccino 3 milk frother. This expands its capability to produce milky delights like lattes and cappuccinos. It has a fast preheating time. This makes it handy for making beverages on short notice. It is small, compact and lightweight. This makes it perfect for people with small or overcrowded kitchens. The biggest complaint which is made about the Inissia is its instruction booklet. Rather than having words, the booklet is filled with little diagrams and symbols. Granted, there is a key to the diagrams and symbols. However, the instructions aren’t intuitive. They make the machine seem more complicated than it really is. Fortunately, they have Nespresso club assistance service. There are also plenty of instructional videos on YouTube or visit http www.nespresso.com for more information. “I discovered this machine while staying in a hotel in England that offered them in all their rooms. Buying one was confusing since the same machine has been variously branded Krupps, Nespresso and De’Longhi. Having bought and used the De’Longhi I can find no difference between it and the Krupps that I used in the hotel. The machine is attractive, compact, well-constructed and very easy to use. The capsule system means that there is nothing to clean but the cage that catches the used capsules and the drip tray. “I’ve used Nespresso before at work and at friends’ homes, but never thought to invest in one until I started renting out a guest room in my home on Airbnb. I originally bought this so guests would have an easy way to make coffee in the morning. I ended up using it more often than I expected.